OVENWEEP is not a well-known national monument. It sits between the border of Utah and Colorado, about forty miles north of Four Corners and is home to a set of Anasazi Indian ruins. I was eight years old when my family turned off the highway and headed toward Hovenweep. We drove down the road at sixty miles per hour. My brother and I opened the windows and marveled at the dryness of the air. Although we were sweating in the ninety-five-degree weather, we couldn't tell because the desert air evaporated the moisture off our skin. Our family had already been to the spectacular--but crowded--Arches and Mesa Verde National Parks. My parents were looking for a more secluded, peaceful destination. The last bit of civilization before Hovenweep is the Hatch Trading Post. We stopped at this oasis within the endless acres of sagebrush. We felt the full effect of the hot desert air when we stepped out of the car. To combat the heat, we bought ice cream from the trading post, then got back in the car and took the final turn toward Hovenweep. A few miles after the turn-off, the smooth pavement gave way to bumpy dirt road. We felt every bump in the "White Charger," our affectionate nickname for our aging '83 Buick Century. After a fun ride through the dust, we pulled into the gravel parking lot at Hovenweep National Monument. We got out and savored the smell of the juniper trees, marveled at the the nearby ruins, but also felt uncomfortable because of the bright sun and desert heat. We went to the nearby visitors' center and basked in the air-conditioned haven, drinking the cold bottled water that is free to visitors. When we were done talking to the rangers and paying a small fee for a campsite, we slothfully walked over to the nearest ruins, which are about one hundred yards from the visitors' center and admired the ancient architecture. We promptly headed to the campsite. At the camp we set up our tent and everyone tried to find a place to take an afternoon nap. After an hour of struggling to harness the bit of shade that a juniper would afford and fending off the gnats, my parents decided to get up and prepare for our departure. The desert was tough on us city dwellers. We decided that we wanted to take a quick look at the ruins before we left, so we packed up the tent and slowly walked out to the main set of ruins called the square tower ruins, named for a multiple story square tower rising from a shallow canyon. Grimy and hot, we prepared to take a few pictures close to the ruins. We were excited because the ruins were not even roped off. You could climb a wooden ladder that leaned on the seven hundred year-old sandstone ruins. This is not usually the case at ancient ruins. As we squinted and strained to avoid the sun for our pictures, a spectacular event transpired. Out of nowhere, dark, gray clouds blew in, masking the blazing sun and dropping the temperature about fifteen degrees. Everyone perked up and we were suddenly awake to all of the natural wonders and beauty of the desert and the ruins. It drizzled sporadically for about an hour. I had never been so impressed by an act of nature. 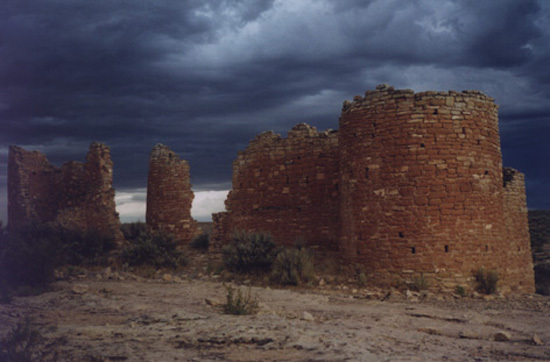 In this air of mystery and mysticism, Hovenweep instantly became a sacred family spot and memory. It felt as if an ancient Anasazi God had been watching over us. We saw all of the square tower ruins--the living spaces, the kivas, the towers, and a primitive dam that they used to collect the desert's most valuable resource. We almost gave into an urge to camp there that night, but we decided that we didn't want to have to deal with the weather that night if it was going to storm, and we knew that the heat would be back the next day. We all left Hovenweep with an altered perspective. It was from that point on that I knew I loved the desert and all it had to offer. Since then, we have been fortunate enough to return to Hovenweep twice and although we didn't have a benevolent storm to help us realize the grace and beauty of the place, we found it each time. We roughed the heat and the gnats both times, but they didn't bother us because we felt so attached to our secluded desert discovery. A few years later, I read Edward Abbey's Desert Solitaire. I could relate to his experiences in the desert and understand that he was truly not bothered by the seemingly barren, hot, and dry climate. On the contrary, he feels that the desert uniquely challenges the human spirit. This summer I am returning to the place of our mystical experience and spending six weeks there as a volunteer to learn about and commune with the desert.